Originally from Dunfermline, Steven studied at Edinburgh College of Art and undertook a scholarship exchange to Kansas University in his 3rd year. Following a year spent in America, Steven returned to Scotland and spent his part-one experience at Elder and Cannon Architects in Glasgow working on several prominent residential developments. After returning to Edinburgh Art College and spending further time in the US at Rhode Island School of Design, Steven graduated in 2003 and quickly joined Reiach and Hall architects as a Part-Two Architectural Assistant. Initially working on residential developments and assisting in competitions, Steven qualified as an Architect in 2005 and quickly established himself within the practice. Steven was made an Associate with Reiach and Hall in 2007 and continued to work on commercial developments for the practice until 2010. 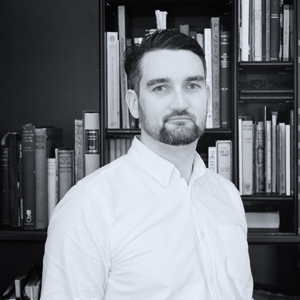 After a brief spell at Michael Laird Architects, working on a Laboratory project, Steven joined JM Architects in 2011 and worked on a wide range of school and further education projects until he joined Hurd Rolland in 2014. Steven joined the practice initially to work on Capital Square but has worked with the wider team on several successful bids which he continues to be involved in. Steven was made a Partner in 2016. Steven’s understanding of the role of an architect and that of the design team leader combined with a wealth of technical knowledge allows him to advise on best value for projects through every stage until delivery. Steven also has extensive experience in dealing with the Planning Process and Listed Buildings, integrating them within modern designs. Steven is eager to develop Hurd Rolland’s client base and further enhance their reputation as one of Scotland’s leading architectural practices.